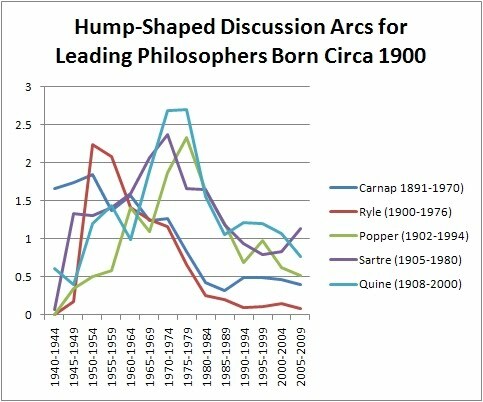 A philosophical discussion arc (as discussed in Tuesday's post) is the trend, over time, in the use of a term or name as a keyword in philosophy articles and books. 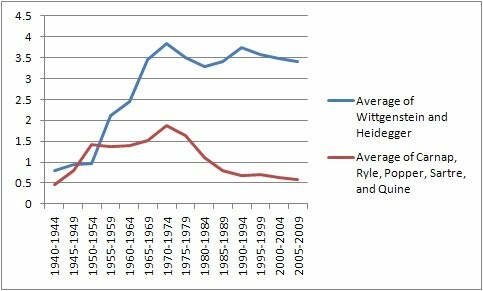 As I mentioned Tuesday, discussion of prominent philosophers' work tends to peak around age 55-70. However, not all philosophers show this trend. 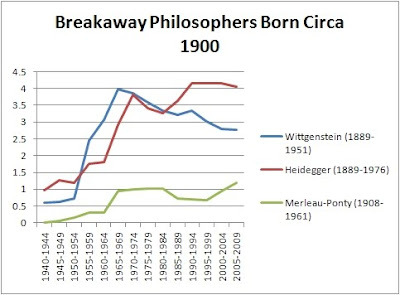 Given that the dataset starts in 1940, the only age cohort suitable for examining breakaways -- philosophers whose discussion arcs continue to rise after age seventy -- is the cohort born around the year 1900. Only for that cohort do we have both peak-career discussion rates and later discussion rates in the dataset. From about 1940-1954, Heidegger, Wittgenstein, Carnap, Ryle, Popper, Sartre, and Quine were all receiving about an equal amount of discussion. But only Heidegger and Wittgenstein increased and sustained that level of discussion in the ensuing decades. 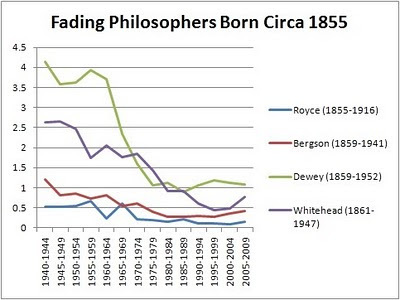 In the previous generation of philosophers, we seem to see the tail end of a similar story, with Frege and Husserl breaking away while Royce, Bergson, Dewey, and Whitehead decline (though declined Dewey is still discussed as much as is broken-away Frege). I'm not so certain that two is a sufficient sample size for this sort of analysis. 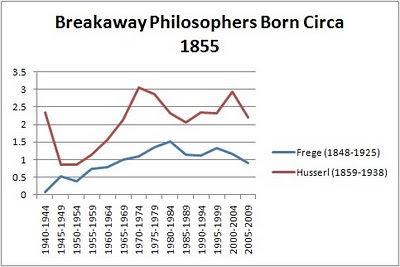 Nice to see how Dewey remains ahead of Frege. Pragmatism remains relevant in several areas of philosophy. A suggestion -- Whitehead's recent rise might track a rise of interest in process theology and panentheism. Why did you not include Nietzsche? As to Heidegger, though everybody mentions him, what they say about him remains empty. And I wonder whether they talk about him in German as much as they do in English, since in German he is not really intelligible. 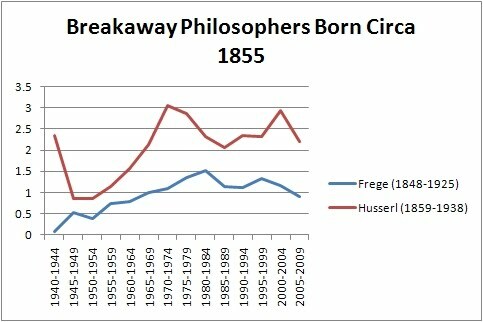 Contueso: Nietzsche was born earlier, but I have a graph on him elsewhere on the blog. Personally, I share your lack of keenness about Heidegger, though I am open to being convinced otherwise someday. "about Heidegger ...... I am open to being convinced otherwise someday." And where is the conviction going to come from? The problem is that you read him in English. Hence, basically, you get the translator's language. Heidegger's book language is a Rohrschach test (if that is the name of a legendary old test where you had to say what you saw in a big ink spot, and your answers were suppposed to yield a personality profile). Well, give somebody a Heidegger text to read and if he says that he understand it, let him SUMMARIZE it. Thank you! 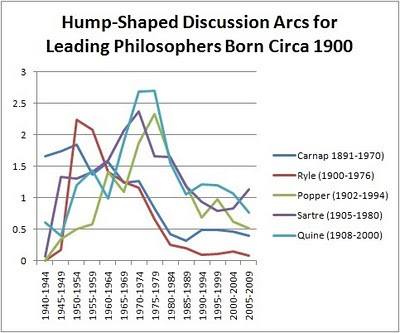 I find this data and information about philosophical discussion activity to be very interesting, despite the fact that it raises a great many troubling questions about general methodology, interpretation, significance, and so on. What does it mean that the notorious Nazi philosopher M. Heidegger is getting a lot of play? Well, it could mean many things, or, it could mean one thing and one thing only. In any event, it is always worth recalling that measurements of activity are not measurements of progress -- either in mundane government program assessment contexts e.g., or, when trying to assess the circulation and actual impact of philosophical ideas in various social contexts. Yet many people mistakenly take activity to be an indicator of progress. Nor is discussion activity in any way necessarily or even strongly related to correctness of philosophical outlooks. Heidegger's rising star could be partly due to monopoly ownership and control of academic publishing houses by German-controlled corporations. Clearly, if this were true it could indicate something other than the holding of correct views, and would become a subject for the sociology of knowledge. Note that the two philosophers who "took off" (Wittgenstein and Heidegger) were anti-philosophers who made strong "end of philosophy" claims. They are the two most visible "counter-enlightenment" figures of the twentieth century. Curious. I'm not sure where this leaves us.